Bridal salons are uniting across America to donate and giving away wedding gowns to qualified military brides. You may qualify even if you had a civil ceremony and are planning an upcoming wedding. Enter to win a $25,000 dream wedding! Service Sunday Elopements is a FREE service exclusively for active duty US military service members and is our way of giving a little something back to the families who give up so much. It was inspired by the commitment and vision of our CEO, as a sophisticated alternative to the “courthouse” wedding. This service is for all active US military members regardless of branch of service, time in the military, or rank. By volunteering one day a month to those active duty military members wishing for a more romantic setting with a more personal celebration, rather than the County Clerks Office or a trip to Vegas, we have stepped up to serve those who serve. * Service Sunday Elopements are held on the 1st Sunday of the month. Only 4 time slots available per day. Elopements to be held at a park in Chattanooga, TN TBD at least 4 weeks prior. Chapel at the Farm supports our active duty military families with complimentary elopement weddings every THURSDAY of the month. We are proud to have hosted many of these ceremonies for our well-deserved military members. This wedding is FREE to all active duty service members.supports our active military families with complimentary weddings or vow renewals every Tuesday of the month. This is our 12 guest Simply Charming Chapel Wedding Package. Vow renewals can be private with just the two of you or share the day with up to 12 guests. A reservation is required and you will need to show your military ID and provide marriage license. If you would like more guests, a different day of the week, or a different package we offer a discounted rate on all of our packages (other than our 99.00 elopement package) for active military. On Sunday November 17, 2019 we will provide a free wedding to one lucky couple and 100 of their guests. This is our way of giving back to those who give so much of themselves. To be eligible for the free wedding either the bride or the groom needs to be an active military member, or a current student of a military school. As a wedding consultant, who specializes in military weddings, I hear brides, who are trying to plan military weddings, lament about the lack of information available about military weddings. Brides are marrying later and are better educated. Even if they are hiring a wedding consultant to plan a military wedding, the brides still want to know as much as possible. Most wedding planning and etiquette books briefly address military weddings, but not to the satisfaction of most military brides. There are situations that face the bride or groom marrying a military person that a civilian couple doesn't always have to face. In addition to embarking on a new journey as a married couple, the military wedding is the beginning of a whole new way of life and culture. A severe case of culture shock may manifest once the new military spouse arrives at the spouse's duty location. Welcome to the brave new world of military jargon, acronyms, ID cards, wives' clubs, customs and courtesies, personnel reassignments, deployments and on and on. Becoming a military spouse is also an exciting adventure--full of new and exotic places, as well as challenges that will test the foundation of your marriage. Or, it will strengthen your partnership as husband and wife, bound by the fondest memories of shared experiences, adventures and challenges conquered. It's enough to make a strong person weak in the knees. It's not a life for the faint of heart. So, this book, The Military Wedding, has been written to make the experience less harrowing and more enjoyable. This book is mainly written for the civilian bride marrying a military groom, but I will try not to overlook the civilian groom marrying a military woman and the military bride and groom. A few paragraphs, as found in most books, won't answer your questions. 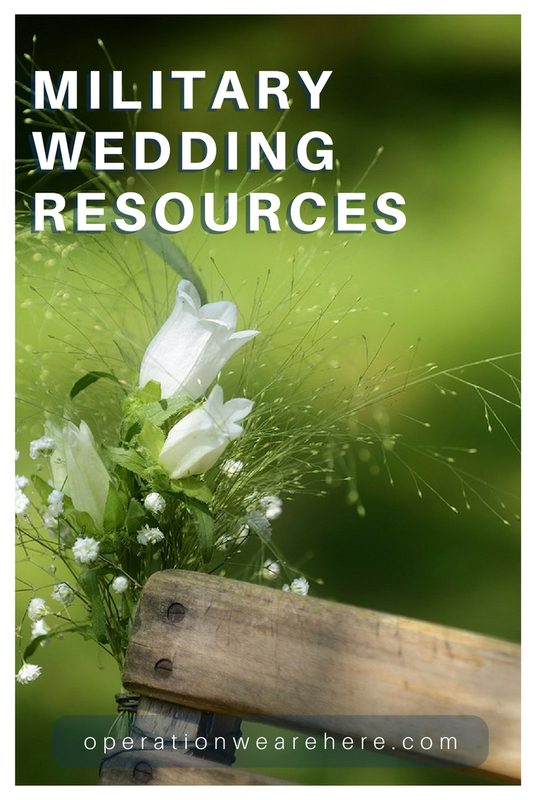 Consider this your military wedding planning manual or special operating instruction to supplement your main wedding planning guide.